The Kir cocktail is a popular appertif in France, it consists of 1/3 Creme de Cassis topped with 2/3 white wine. We found a recipe that uses Gin to create a Martini version of the traditional drink. This was our introduction to Creme de Cassis, the liqueur made from the black currant berry. The Kir is named after Cannon Félix Kir, a priest who became a hero of the French resistance during World War II. He enjoyed the local white wines combined with Creme de Cassis. He was also mayor of Dijon from 1945 to 1968 and the the Kir became the official apertif at town hall receptions. The drink had previously been known as ‘vin blanc cassis’, but thanks to Cannon Félix Kir the drink became known as Kir. 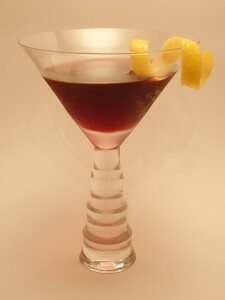 Combine gin, dry vermouth and creme de cassis in a cocktail shaker half filled with ice. Shake, then strain into a chilled martini glass. Hercule Poirot always drank Creme de Cassis, wrinkling the noses of his English friends who were appalled at his sweet tooth. Because of him I always meant to try it, but never have. Perhaps I’ll put it on this year’s liqueur list.